A great day for Matched Betting with lots of the favourites winning so money back on a few offers, and plenty of profit if you backed an outsider for the refund offers. Tomorrow is normally the biggest day in terms of price boosts and there may be a few more offers cropping up throughout the day. Moplay have been officially announcing offers quite late in the day so expect something from them. If you haven't done their sign up yet, do it now! The free bets are almost instant and it's a simple bet £10 get £30. You can find the guide here. Below I've updated the offers for day 4 and will keep it updated throughout Friday morning should anything else profitable arise. Be sure to head over to the Oddsmonkey's Forum if you have extra time/a bigger bank so you can target some more refunds such as the 2nd/3rd to sp, and of course the extra place offers! Bet365 are offering a £50 free bet for the 15:30 race, when you bet £50 on another race. The race chosen is different to yesterday's, but the same as the first 2 days. Sportpesa are offering a refund up to £25 if your horse loses, but the SP favourite wins. This is a fantastic offer, but you must bear in mind it must be the SP favourite that wins. So it's not 100% risk free until you know who the SP fave is. *Lay THE SP FAVE with the amount in the "lay stake" box at the bottom under the "trigger bet lay"
1) Favourite wins (so your bet loses) - you receive a £25 free bet from option 1, and you've locked in profit from option 2. 2) Favourite doesn't win - you receive nothing from option 1, and you've locked in profit from option 2. If your horse wins the first race, Coral will match your winnings up to £25 as CASH. If your horse wins, you'll receive £25 as cash. If your horse wins the first race, Bethard will double the odds and pay out winnings as CASH. They've updated the offer so the max extra payout you get is £50. If your horse wins, you'll receive double the odds and so double the winnings! Ladbrokes are offering a £1 free bet for any race on day 1. If your horse wins, Unibet will match your stake up to £20. This is available on all ITV races on day 1 and not the 16:50 or 17:30 races. Bets can only be placed within 15minutes before the race scheduled start time. Free bet is only valid for 4 hours. *Lay Sir Erec with the amount in the "lay stake" box at the bottom under the "trigger bet lay"
1) Sir Erec (so your bet loses) - you receive a £10 free bet from option 1, and you've locked in profit from option 2. 2) Sir Erec doesn't win - you receive nothing from option 1, and you've locked in profit from option 2. 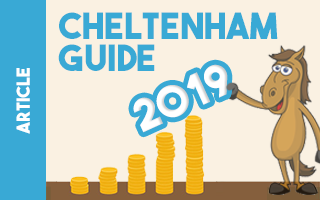 There is so much going on over Cheltenham that it can be hard deciding what you should be doing, so we've made a simple table with the best offers for you below. If you're struggling managing either your time or bank, then make sure you're at least getting on the below offers as you can make a decent profit from these alone. For those of you with more time and/or a bigger bank, click on the Oddsmonkey link below to be taken to their dedicated forum post. 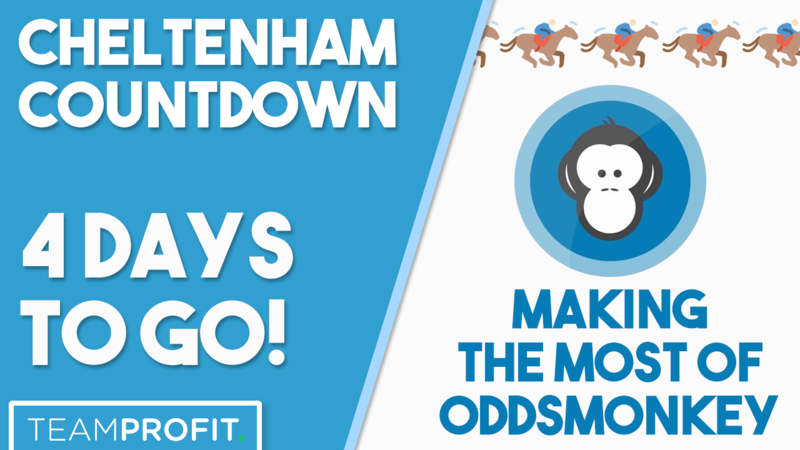 On here you will find plenty more reloads that aren't necessarily guaranteed profit, but are great value and will help you extend your profits this Cheltenham! Make sure you subscribe to the Price Boost Thread below. The profits are going to be HUGE and you could potentially make more money from these than from free bets! Oddsmonkey will be a very profitable tool to have this Cheltenham. If you don't have them yet, sign up here and get 7 days for £1. The festival lasts 4 days and you're getting 7 days for £1 - it's a no brainer! They will have an offer thread with all of the available offers over the festival, as well as their notoriously lucrative price boosts thread where you should be able to make a few hundred pounds+ very easily over the festival. Boosts Can Range from £1 to £10 Per Bet! A MUST HAVE tool for Cheltenham! Find all of the best odds, quickly! There will be a few enhanced sign up offers over Cheltenham which we'll list below. These will be slightly better offers from bookmakers that you may not have, so it's the perfect time to jump in and sign up to them. 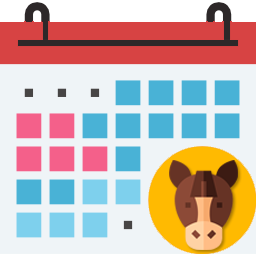 The offers will only be around for a limited time so make sure you complete them as soon as possible, and use the boosted bank balance to smash the last few days of Cheltenham! Bet £40 on any race, get £40 refund! Best odds guaranteed is a promotion that most bookies offer on the horses. If you bet on a horse and the price increases, and it wins, you will receive payment for the increased price. This can be extremely profitable and you can read more about it here. Alot of the bookies restrict when you are eligible for BOG (best odds guaranteed) though, and so you need to try and keep your betting within the correct times for each bookie, just incase you qualify. Some will allow you to bet at any time and be eligible, but others may be "day of the race", or "after 9am on the day of the race". See the list below for more info on when a bet can be placed!